Galinsoga parviflora is an herbaceous plant in the Asteraceae (daisy) family. It has several common names including guasca (Colombia), mielcilla (Costa Rica), galinsoga (NZ), gallant soldier (UK)/(USA), and potato weed. It is also known by the taxonomic name Tridax parviflora. Galinsoga parviflora was brought from Peru to Kew Gardens in 1796, and later escaped to the wild in Great Britain and Ireland. In Britain its name Galinsoga is sometimes popularly rendered as "gallant soldiers", and then sometimes altered to "soldiers of the Queen". In Colombia it is used as a spice herb in the soup Ajiaco. It can also be used as an ingredient in leaf salads. In much of the world it is considered a weed. You can use the leaves especially of young plants seen above, stems and even the flowers in smoothies, salads, stews, steamed or juiced and mixed with other juices. It is mild in flavour and can be dried for winter use. 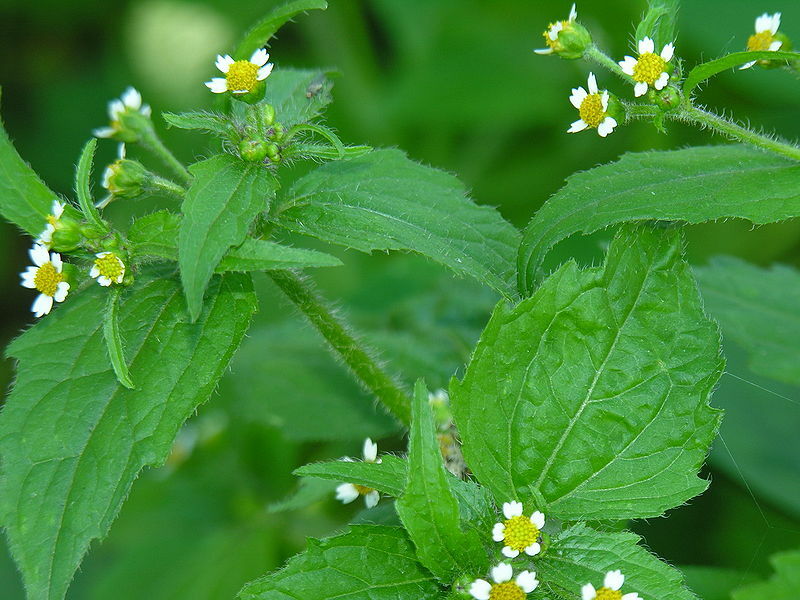 Galinsoga is another remedy (along with plantain and dock) for neutralizing the sting of nettles. It is astringent in its action and can be used to help clot the blood of cuts and wounds. In 100gm of this plant there are 3.2g protein and 1.1g of fiber (compared to spinach which has 2.9g protein and 2.6g of fiber). It is high in calcium: 284mg per 100gm (parsley 140mg), Vitamin A or beta carotene, magnesium, potassium, zinc, B1 (thiamin), B2 (riboflavin), B3 (niacin), and Vitamin C as ascorbic acid. Read more at wikipedia and here Link1.